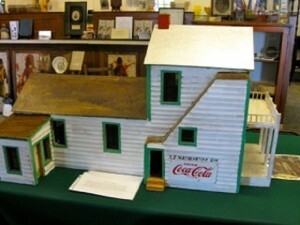 A model of “The Cosmopolitan Inn”, the first African-American owned business in Caroline County. Each inch of the model is equivalent to one foot of the original building. We thank the family of Reverend Louis Jackson for loaning this item for our community enjoyment. An original copy of the book “Uncle Tom’s Cabin”, with two commemorative plates. A Black Americana Collection including vintage, cast-iron “Aunt Jemima” Piggy Banks, some dating back to 1889. Who was Aunt Jemima? We thank the family of Thomas Lewis for loaning these collectibles for our community enjoyment. Tools and furniture used by and made by African-American slaves.